Managing pain includes helping the patient understand why they have pain and creating realistic expectations for relief. Individualised pain scales can be used to assess the severity of pain and impact on function. Pain should be treated in a step-wise approach, moving from simple analgesia to potent opioids. Pain is a common problem. Patients tell us if they have acute pain they are often vocal, upset and asking for help. In contrast, chronic pain is often hidden and unless we ask patients we may not find out they are in pain. The burden of chronic pain is in its impact on daily life. Managing pain includes helping the patient understand why they have pain, creating realistic expectations for relief and treating the pain. Although not covered in this article, the psychological aspects of care are paramount. Factors such as anxiety and depression, which may reduce tolerance to pain or be exacerbated by pain, must also be assessed and treated. From a practical point of view, pain is either generated by damage to the nerves (neuropathic pain), or by damage to other tissues (nociceptive pain). The anatomical source of the pain should be identified and this will then guide treatment. It is important to be aware that people can have more than one source or type of pain at one time. The relationship between a painful stimulus and the experience of pain is extremely complex. Modification of the stimulus occurs in the peripheral and central nervous systems. The final perception of pain is strongly influenced by emotion and cognition. Where is it? Does it go anywhere? What makes the pain worse? What makes it better? How does it impact on daily life? For people with communication difficulties (e.g. dementia, confusion, coma, learning difficulty) diagnosing pain may not be as simple as asking them. Pain can cause a variety of behaviours and signs. Change in behaviour is a key indicator. Expressive: grimacing, clenched teeth, frowning, eyes open wide or shut, crying, sighing, moaning. Adaptive: rubbing or holding area, keeping area still. Distractive: rocking, pacing, biting, clenching fists. Postural: flinching, head in hands, limping. There are separate pain scales for children and for patients in intensive care and long term care facilities. Pain is what the patient says it is. It cannot be measured directly but pain scales may be used to assess severity. The most clinically useful pain scales include an assessment of impact on daily life. 4 = Severe and continuous overwhelming pain. Unable to think of other matters. 3 = Severe pain often present. Activities and concentration markedly affected by pain. 2 = Moderate distress, occasional bad days, pain limits some activities. 1 = Occasional grumbling, single pain. Patient not bothered to be rid of symptom. Scales can be made even more useful if they are personalised. For example, in the case of a patient with severe arthritis in their hip, level four could be continuous pain day and night with the patient being unable to sleep, level three could be the patient is able to sleep but is still troubled with pain while they are awake and so on. These scales can be used to set individual goals. Numerical rating scale: pain is rated on a scale from 0 (no pain) to 10 (worst pain imaginable). Verbal rating scale: a four-point scale in which pain is rated as none, mild, moderate or severe. Visual analogue scale: an unmarked line with “no pain” at one end and “worst pain imaginable” at the other end. Faces pain scale: There are several versions available showing smiling or neutral faces for no pain and sad or crying faces indicative of severe pain. So what is causing the pain? In order to manage pain, work out which tissue the pain is coming from. At its simplest, this divides neuropathic pain from nociceptive pain. Nociceptive pain then needs to be diagnosed further using the same process as with any differential diagnosis. Sharp and burning with associated allodynia (sensation of pain due to light touch). Diagnosis: neuropathic pain, query shingles. Pain worse on movement, tender to touch, associated with bruising. Diagnosis: nociceptive pain, soft tissue injury. Sharp pain worse on breathing, associated crackles on auscultation and fever. Diagnosis: nociceptive pain, pleurisy. Central, crushing pain, worse on exercise, associated dyspnoea. Diagnosis: nociceptive pain, ischaemia. Central, burning pain, worse after eating. Diagnosis: nociceptive pain, oesophageal irritation. Tight, hot, burning sensation localised around wound. Diagnosis: nociceptive pain, skin infection. Medications that may be considered for treating pain include drugs that treat specific conditions (adjuvants) and drugs in the analgesic ladder. There is one ladder for nociceptive pain (see below) and one for neuropathic pain. Pain control is not always easy. It can be complicated by psychological and addiction problems. Adverse effects of medications may be problematic. Don’t hesitate to seek advice from a specialist. 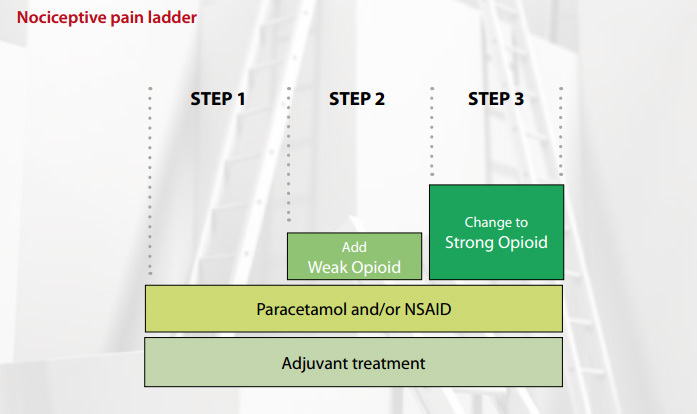 Adjuvants are included at every level of the analgesic ladder and may be the only analgesia needed for some conditions. A – consider an antiemetic. Opioids may produce nausea at the beginning of treatment. In some cases, it may be ongoing. Opioid related nausea is produced through two effects - the first is reduction in gut motility which can be successfully treated with metoclopramide 10mg, three to four times per day. The second is a central effect which is traditionally treated with haloperidol 1–2mg, once per day. Doses should be modified for individual patients. B – Breakthrough. Analgesics work best with regular dosing, but pain may still break through. When a regular dose of a strong opioid is prescribed, a short-acting formulation should also be prescribed at one sixth of the total 24 hour dose, to cover any breakthrough pain. For example, a 24 hour dose of morphine of 60mg would require a breakthrough dose of 10mg. C – Constipation. “The hand that prescribes opioids should always prescribe a laxative”. Unless being used to control diarrhoea, the patient should be prescribed a stimulant plus softener combination laxative such as docusate sodium with sennosides (Laxsol). Mild pain of many causes will respond to paracetamol. NSAIDs are also effective in treating mild to moderate pain, particularly if an inflammatory process is involved. If tolerated, it is recommended that these drugs are continued through the analgesic ladder. One advantage of weak opioids is that they do not require a controlled drug script. However they all act like morphine and have the same range of adverse effects. Consider that giving a patient 60 mg of codeine, four times per day, is the equivalent of 24mg of morphine in 24 hours (Table 1). A weak opioid should be added to, not substituted for a non-opioid. There is no advantage of changing between weak opioids. Do not “kangaroo hop” from weak opioid to weak opioid. If a weak opioid is inadequate when given regularly, change to a strong opioid (e.g. morphine). Morphine is the most familiar strong opioid and therefore is first choice. To move a patient from a weak opioid to morphine, because their pain is not controlled, first work out what their current equivalent morphine dose is. For example 60 mg of codeine, four times per day, is the equivalent of 24mg of morphine in 24 hours (Table 1). Therefore, because the pain was not controlled at this dose, a reasonable starting dose of morphine would be 20mg twice per day. The dose of morphine is titrated until pain control is achieved or adverse effects are intolerable (Table 2). There is no top dose of morphine. Two main fears can inhibit the prescribing of opioids. The primary concern is regarding addiction. Use of opioids in patients with non-malignant chronic pain is associated with a low risk of addiction (about one in ten thousand patients). Care however should be taken in patients who have a high risk for addiction and those who are suffering from central sensitisation pain. The second concern is the fear of respiratory depression. However pain is a physiological antagonist to the central depressant effects of opioids. Strong opioids do not cause clinically important respiratory depression in patients in pain if titrated according to pain. If the pain is relieved, such as in a patient who has had successful orthopaedic surgery for low back pain, opioids may be slowly withdrawn to avoid withdrawl symptoms. Add up all the opioids taken in the previous 24 hours including regular and breakthrough doses. Divide this figure by two to make a new regular twice daily dose. Remember to recalculate a breakthrough dose, e.g. a patient on 30 mg twice per day who has taken four 10mg breakthrough doses, has a total 24 hour opioid dose of 100mg. The new regular dose would then be 50mg twice per day, with a breakthrough dose of 10–15mg — one sixth of the total 24 hour dose. Numbers can be rounded to make simple regimens with available strengths. Increase the regular dose by 30 – 50%. For example, if a patient is on a total daily dose of 60mg, an increase of 30% would take this to 80mg and an increase of 50% would take this to 90mg. Choose whatever dose is easiest in terms of available strengths, e.g. 40mg, twice per day. Recalculate breakthrough dose. Pethidine is not recommended for chronic pain control. Its short duration of action and high peak increases the risk of addiction. For the same analgesic effect it has more adverse effects. Be aware that 50mg of pethidine is equivalent to 12.5mg of morphine. Ongoing adverse effects may necessitate rotating to another strong opioid. Changing to another opioid requires calculating the equivalent morphine dose that the patient has been using (Table 3). Figures are approximate because individual patients metabolise opioids differently. Patient apprehension about the use of morphine or the presence of impaired renal or liver function may necessitate selecting an opioid other than morphine. Fentanyl patch 100 – 150 Refer to manufacturers instructions for dose conversion (see here for an example of this). Methadone (oral) 5 – 20 Dose conversion varies depending on duration of use and dose of opioid. If rotating, specialist advice is needed. Current Learning in Palliative Care. Diagnosing the cause of pain. Available from: http://www.helpthehospices.org.uk/clip/. Accessed August 2008. Support Team Assessment Schedule (STAS). Available from: http://www.kcl.ac.uk/schools/medicine/depts/palliative/qat/stas.html. Accessed August 2008. Australian Medicines Handbook. Adelaide, July 2006. World Health Organisation Pain relief ladder. Available from: http://www.who.int/cancer/palliative/painladder/en/index.html. Accessed August 2008. NHS. The use of strong opioids in palliative care. MeRec Briefing 2003; 22.